Proteins are complex substances made of amino acids arranged in chains. They are very diversified in their composition, form, and role. Some are involved in the structure of the body, such as collagen. Others participate in its functioning while contributing to, for example, muscle contraction, nervous conduction, and immunity. Proteins of the body are manufactured using amino acids resulting mostly from the digestion of proteins contained in food. Meat, fish, eggs, and dairy products constitute the main sources of animal protein. Cereal products (bread, rice, cereals, etc. ), nuts, grains and legumes (including soy) are sources of vegetable protein. An insufficient level of protein can cause growth problems in children, general weakening, muscle atrophy, and a greater susceptibility to infections. A surplus of proteins, particularly of animal origin, can constitute a risk factor for obesity and increase the risk of cardiovascular disease and cancer. 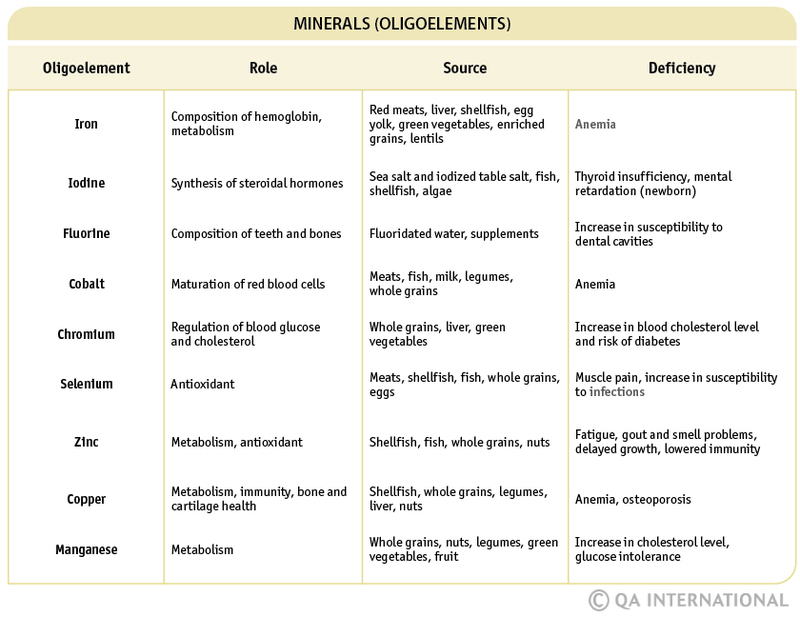 Minerals are inorganic chemical elements that are indispensable for the body. Based on the quantity normally present in the body, a distinction is made between macroelements and oligoelements. A macroelement is a mineral present in a relatively large quantity in the body (more than 5 g for a 154 pounds [70 kg] man). There are seven of them: phosphorus, potassium, calcium, magnesium, sodium, chlorine, and sulfur. 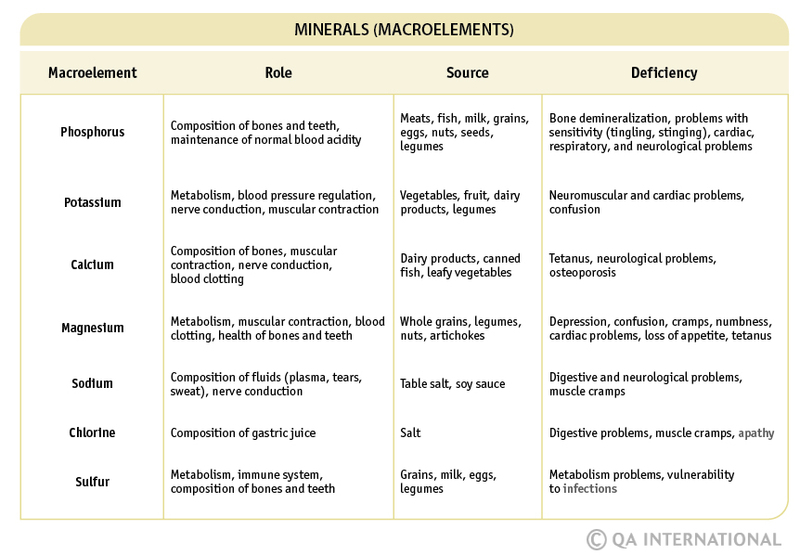 Macroelements enter into the composition of certain tissues (bones, teeth) and fluids (blood, saliva, tears, sweat, urine). They are fundamental to the conduction of nerve impulses and muscular contraction, and participate in numerous metabolic reactions. An oligoelement is a mineral present in the body in a very small quantity yet indispensable to its functioning. The most important oligoelements are iron, iodine, fluorine, cobalt, chromium, selenium, zinc, copper, and manganese. Antioxidants are substances capable of neutralizing the excess of free radicals produced by the metabolism. These free radicals contribute to the acceleration of aging and diseases such as cancer, certain cardiovascular problems, senile dementia, and other diseases related to aging. The main antioxidants are the phenolic compounds (substances produced by plants); Vitamins A, C, and E; selenium; and zinc. Coffee and tea are noncaloric drinks, as long as they do not contain sugar, milk, or cream. These two drinks contain caffeine, a stimulating substance that temporarily increases vigilance, arterial pressure, and heartbeat frequency. The effects, variable depending on the sensitivity of the individual, increase with the quantity absorbed. The recommended limit for an adult in good health is 400 mg per day, that is, 3–4 cups of filtered coffee or 9–12 cups of tea, or 300 mg per day for a pregnant or nursing woman. People suffering from high blood pressure, cardiovascular diseases, or sleeping disorders should also decrease their consumption. Too much caffeine can cause irritability, anxiety, tremors, palpitations, and heartburn. Recent studies attribute beneficial effects to green tea in cancer prevention due to the antioxidants it contains.